A 4 mile circular walk. Instructions are given from Elephant & Castle Station but Kennington Station is on the route. There is an option to visit Kennington Park (not included in mileage). Exit the station to the Tabernacle and Fusion Leisure Centre. The leisure centre occupies the site of a school which was there until 1965. The Metropolitan Tabernacle was built for the Baptist Charles Haddon Spurgeon in 1861. From here he preached to congregations of up to 6000 people (it seated 3500). The building was destroyed by fire in 1893 but the portico remained and was also retained when the chapel was rebuilt after WWII damage. The site had previously housed the Fishmongers' Almshouses. The Elephant & Castle, from the pub that gave the area its name, has been resited outside the shopping centre opposite. The pub originated as a smithy and was last rebuilt in 1898, closing in 1959. The Medieval church of St Mary's was rebuilt in the 1790s but demolished for road widening in 1876. Its churchyard became a public park (see plaque). Go south along Newington Butts then bear right into Kennington Lane. Right into Renfrew Road. On the left a section house replaced the police station in the 1930s. On the right is a former fire station, built in 1868 and extended (to the right) in 1896, now converted to residental use. Adjoining is a former police court of 1869, now a Buddhist Centre. Beyond this is the former Court Tavern pub (now apartments). Between these buildings was the entrance to the Lambeth Workhouse, some buildings of which remain (see resources). Return along Kennington Lane then go right alongside Fontenoy House. Right along Kennington Park Road. The Guinness Trust Buildings were constructed in 1900. A replacement for the parish church was designed by J Fowler. Most of this was destroyed in WWII and the new church was opened in 1957. The road has some fine Georgian houses. Kennington Station was on the City & South London Railway. Opened in 1890 this was the first tube railway operated by electric trains, known as the 'Twopenny Tube'. The dome housed a hydraulic lift. There are premises of the British Legion (in a former pub) and Territorial Army. Walworth City Farm opened in 1987. The park opposite is a remnant of the 13 acre Surrey Gardens. These pleasure grounds with water gardens and entertainments were visited by Queen Victoria and her family in 1848. From 1831 they housed the Royal Surrey Zoological Gardens which had a variety of animals including the first giraffes. The zoo closed in 1856 but the Royal Surrey Gardens Music Hall which could seat 10,000 people was built on the site. The gardens were sold in 1872 and the concert hall demolished to provide land for housing. To include Kennington Park: Go along Doddington Grove opposite TA building then continue along Doddington Place. Right at Cooks Road then left into St Agnes Place. To exclude Kennington Park: Walk through Surrey Gardens into Chapter Road and go right then left along Westcott Road. Both routes: SE along Cooks Road. To the right is the post war Brandon estate. St Wilfred RC Church was built in 1915. Left at Chapter Road then left around Lorrimore Square. The land was previously a common known as Lower Moor. Houses on the south side remain from the mid 19th century. St Paul's Church was built in 1856 but destroyed in WWII. The 1960 replacement has stained glass by Goddard & Gibbs. Walk through the small park exiting via the ornate gates. The animal sculptures represent the animals of the Royal Surrey Zoological Gardens. Continue around the square and go left at Carter Street. At the end is the Beehive pub where there was formerly a tea garden. The cricketers who used to play in its grounds moved to the Oval in 1844. Right along Penrose Street continuing into Fielding Street. Pelier Park is on the site of the Montpelier Tavern and Tea Garden. This became a music hall and then a cinema. Retrace your steps and go right at Sutherland Square. 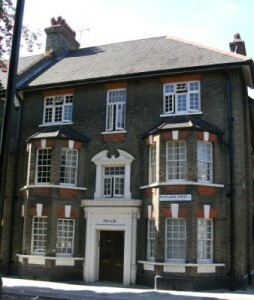 St Paul's had a school at number 55 from 1857 to 1956 when it moved to Penrose Street. The railway cut through the area in 1862. New houses on the left replaced a laundry and tobacco factory. At Walworth Road detour left to view the former police station (1860-1993) in Carter Place. Detour right to view Edwardian shops. Cross Walworth Road into Liverpool Grove. The Sutherland Chapel was built in 1842 and closed in 1904. It became the Electric Theatre and was then used for storage before being converted to flats (Malvern House). Housing opposite was built for the Ecclesiastical Commissioners of England (ECE) in 1842. St Peter's Church was one of the 'Waterloo' churches designed in classical style by Sir John Soane in 1824. An associated school was built in 1839 but replaced by the present building in 1905. The vicar provided meals for poor children and kept some animals in the vicarage garden which became known as 'Monkey Park'. In October 1940 a bomb killed 64 people sheltering in the crypt and damaged the church. It was restored by T Ford in 1953. Continue along Liverpool Grove, go right into Portland Street then left along Merrow Street. The Church Commissioners redeveloped this 22 acre estate, which had previously been slum housing, in the early 1900s in conjunction with Octavia Hill. The conservation area provides 600 dwellings. There is a health centre on the corner with Villa Street. Left at Villa Street and left along Burton Grove. Right at Portland Street. Faraday Gardens were a gift of the Church Commissioners. In WWII they housed a shelter for 632 people. In Trafalgar Street to the left is a board school. East Lane was once a lane leading to the fields. It has an old established market. Walk through the open space to the right into Brandon Street and go right. John Walter, a clerk to the Drapers Company, founded almshouses in 1642. The old buildings were demolished for the Elephant & Castle development. New homes (Walter's Close) were built in 1961. On the left is the St John's Institute. St John the Evangalist Church, designed by Henry Jarvis, was built in 1860 and the school in 1863. Charlie Chaplin's parents were married in the church. The health centre building has blue plaques to Michael Faraday and Charles Babbage. Baldwins, which sells natural remedies, was founded in 1844 (look inside). On the corner with Browning Street is Herbert Morrison House. As the Robert Browning Settlement this provided medical treatment, legal advice, social and educational activities, a Christmas club and holidays for poor children. From 1899 it was the home of the National Committee of Organised Labour which campaigned for old age pensions until 1908. It was renamed when it became the HQ of the London Labour Party. The former King's Head pub had an assembly hall on the first floor. It was rebuilt in the 1880s. Occupation Road was a mews which led to a slaughterhouse and zinc works. Beyond this are the buildings of the coroner's court & mortuary and public baths & swimming pool (1898-1978). Part of this is now a Buddhist Centre. The Church of Jesus Christ Latter-Day Saints (Mormons) replaced a mission church. Right at Penton Place. Go through the park (Pullens Gardens) to the right then return along Amelia Street. This is part of Pullen's Estate, developed by local builder James Pullen between 1886 & 1901 and now a conservation area. Tenants paid 8/- per week (in 1899) for three rooms with kitchen and scullery. An additional 6d was charged for gas and cleaning of the stairs. Ground floor properties had direct access to the workshops behind. Some of the twelve blocks were bombed and others have been demolished, including the site now occupied by the park. Just past numbers 212-226 go through Iliffe Yard to the right. These workshops with living accommodation are now occupied by craftspeople. Right at Crampton Street then left along Amelia Street. The former industrial estate alongside the railway has been replaced with flats. The Health Centre was opened in 1937 and the Library in 1893. The vestry meet in the parish school until 1865 when the new vestry hall, designed by Henry Jarvis, was opened. It became the town hall for Southwark in 1900 but the enlarged council moved to Camberwell in 1965. The building now houses the Cuming Museum. There is a war memorial outside 'In memory of 925 inhabitants of Southwark who lost their lives in the enemy attacks on London 1939-1945'. Detour into Wansey Street to view the side elevation and colourful new buildings. Continue northwards along Walworth Road back to the station. Numbers 140-152 were developed by Henry Penton in the 1770s. The Terrace was renovated as the Labour Party HQ in 1978.